What is going on around St. John's Today? While searching for something else on line, I came across these old photos from the former Detroit Publishing Company, now on deposit with the Library of Congress. 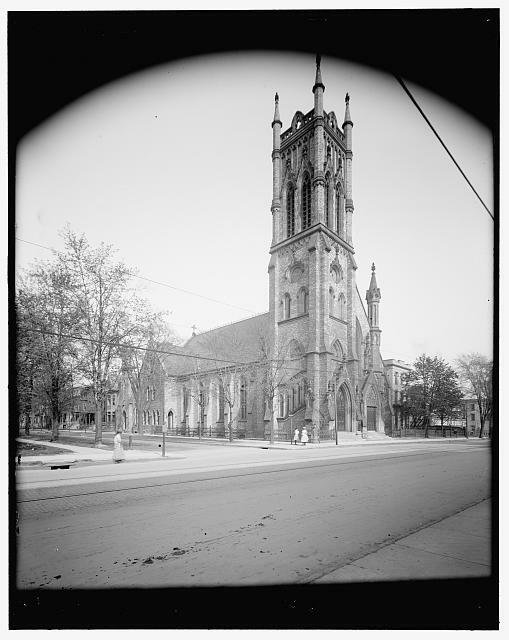 The first is a picture of St. John's from 1900 to 1910. The second and third are up Woodward the other way, with Central Methodist in the foregroun d, St. John's, and the spire of the old Woodward Baptist Church behind it (now burned down and replaced by the new Crosswinds Housing Development). As we approach our 150th Anniversary it is neat to find these things!